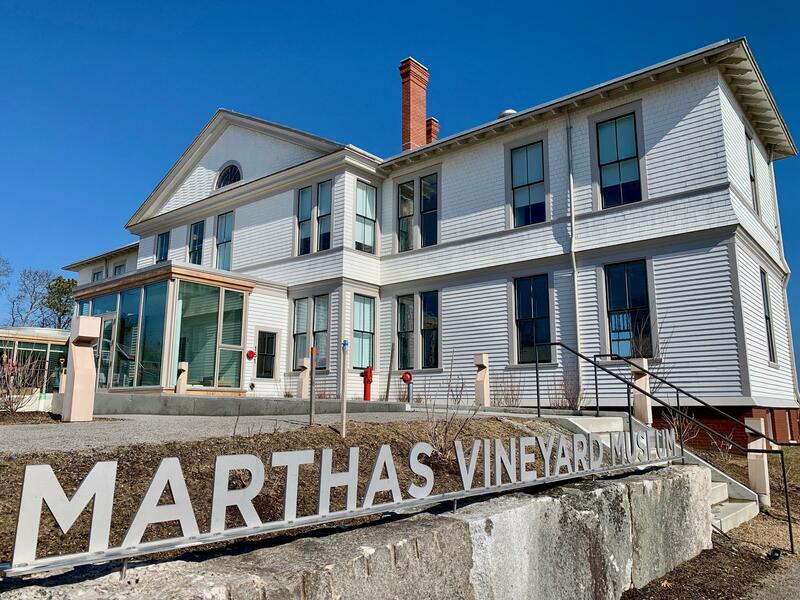 The new Martha's Vineyard Museum is a renovated marine hospital in Vineyard Haven. The newly opened Martha’s Vineyard Museum sits on a bluff with stunning views of Vineyard Haven harbor. It’s a renovated structure with an interesting past. 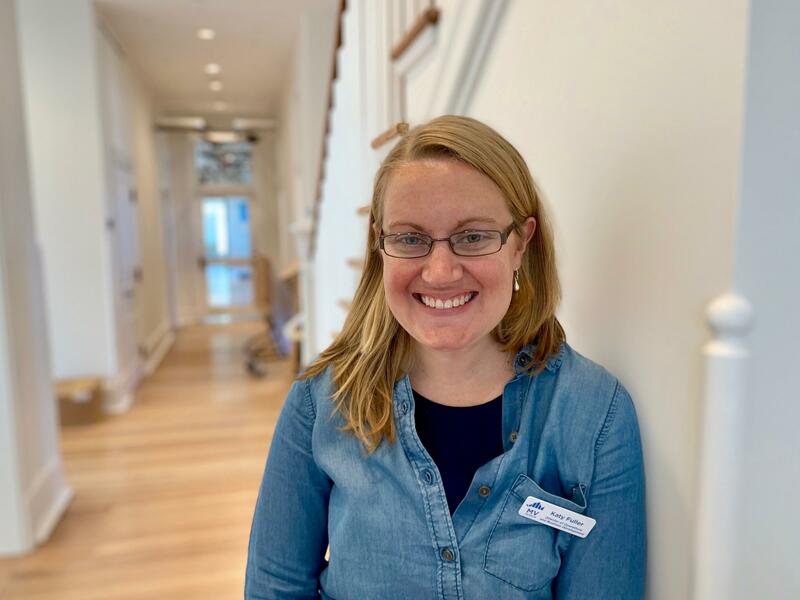 Katy Fuller is the Museum's Director of Operations. Eventually, the original building fell into disrepair and was mostly hidden from view and forgotten. “There was shrubbery, arbor vitae’s. Trees had just grown up in front of the terrace. No one knew it was here,” Fuller said. When the property came on the market in 2011, the Museum bought it, having outgrown its previous home in Edgartown. One of the first tasks was to remove all the overgrowth and restore the site to its original appearance. The design team wanted to save as much of the old building’s components as possible, and use whatever they could in the renovation. 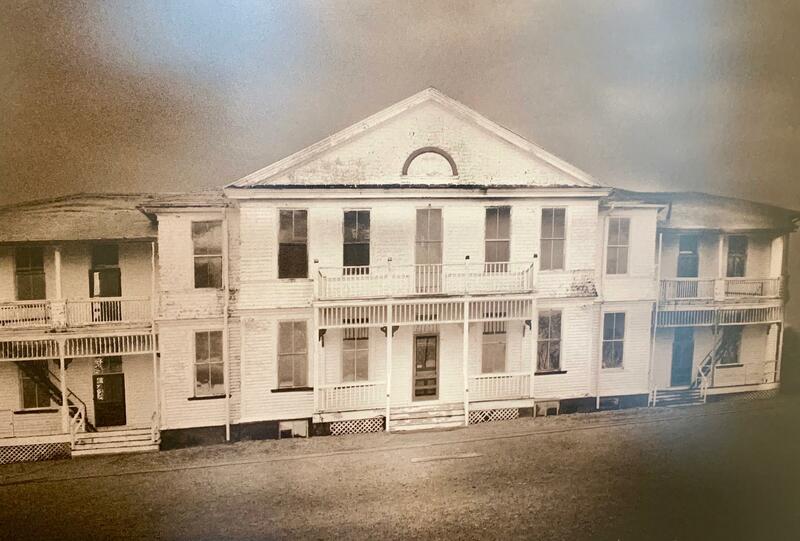 This old photo shows the condition of the building before renovations began. The new space is almost three times the size of the Edgartown location. One of the first exhibits is in the Community Gallery. “We’re starting with this exhibit called ‘Lost and Found’, which is all images, artwork of the building before we did any renovations to it. Although we bought the property in 2011, we didn’t actually do any construction to it until 2017," said Fuller. The main exhibit space is called ‘One Island – Many Stories’. 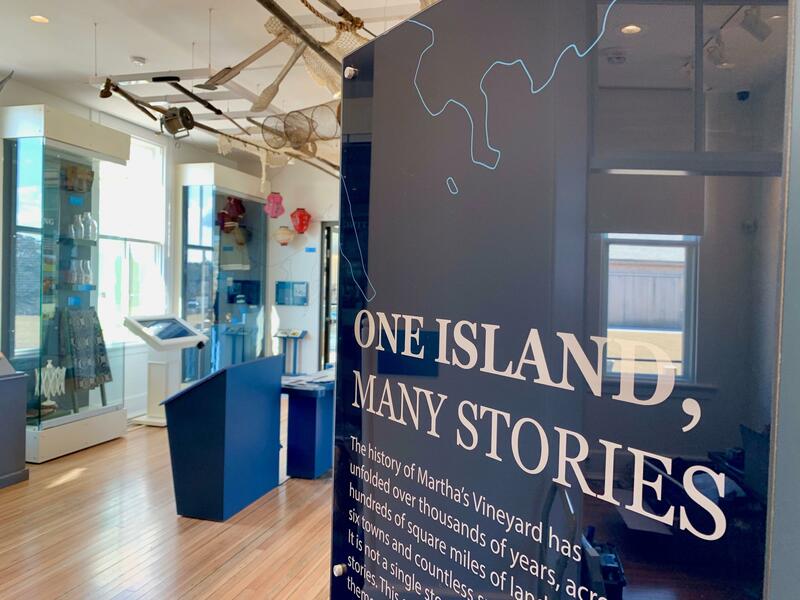 It tells the stories of each town on the Vineyard, and features kiosks where visitors can listen to oral histories of Martha’s Vineyard residents. The main exhibit space is called "One Island - Many Stories." 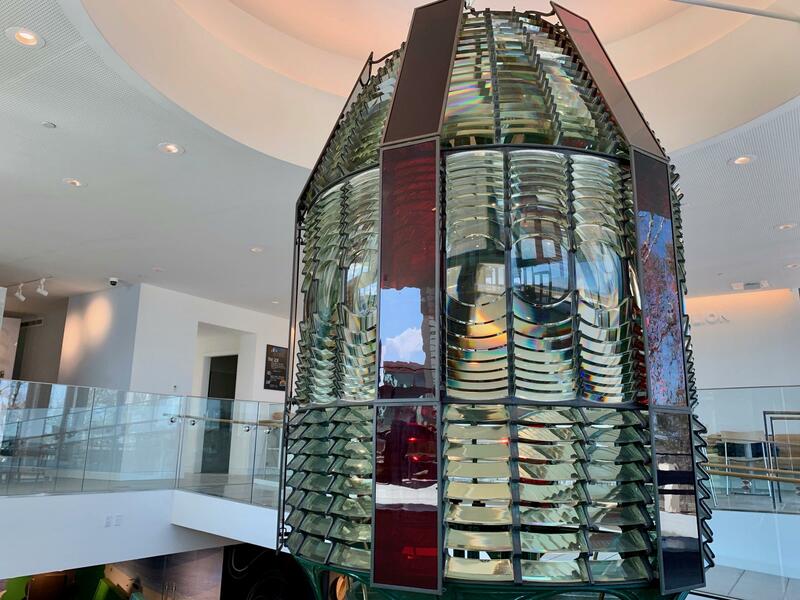 A newly built glass pavilion is flooded with natural light, and dominated by an enormous Fresnel lens – the original 1856 lens from the Gay Head Lighthouse. “We took it apart in Edgartown in May, and it got restored and put back together here in October. She’s a stunner,” said Fuller. The 1856 Fresnel lens from the Gay Head Lighthouse sits in the center of a newly-built glass pavilion. Downstairs is an area called ‘Hands on History’, an interactive play space for kids. It includes a recreation of a berth on a whaling ship, modeled on the diary recollections of Laura Jernegan. “She was a young girl who went on a whaling voyage with her parents – Jared Jernegan was her Dad, and he was the whaling captain. And we have her journal that she kept as a young child, so that’s been turned into a whole interactive screen that the kids can look into, and so this is designed to be what her quarters would have been like on that whaling journey,” said Fuller. Behind the main building, a new structure houses all the vehicles, boats, and other large objects in the Museum’s collection. In the old space in Edgartown, many of those items were kept in a small enclosure called the ‘carriage shed’. “Basically, visitors could just walk in, look at it all. There was no interpretation, people didn’t know what they were looking at. And this allows people to walk through it – we have stuff suspended from the ceiling, there’s a lot more artifacts in there,” said Fuller. Natural light floods the sitting area in the newly-built glass pavilion. 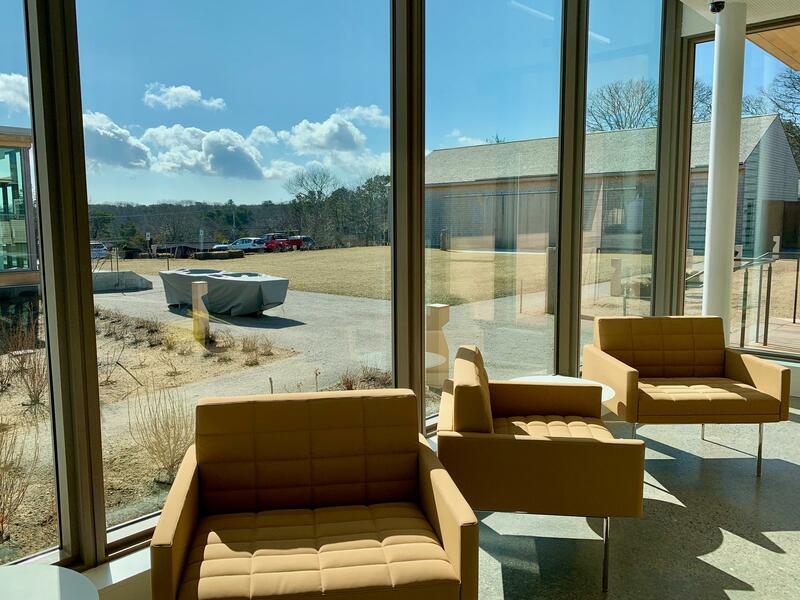 After seven years of planning, the Martha’s Vineyard Museum now has enough space to adequately showcase the island’s rich and varied history … and it breathes new life into a once-neglected structure with a fascinating past of its own. “You could tell the history – you could feel the memories on the walls. I think we definitely did as much as could to protect it,” said Fuller.